Crosstalk cancellation is the crux of SDA. Exactly. Its' nothing mystical or magic. SDA's are simply a two way loudspeaker with some extra drivers strategically placed and wired to reproduce a difference signal. Think the old Halfer circuit but used at the front of the stage instead of as ambient rear surrounds. The more I think about your approach the more I see advantages to the Active vs Passive SDA setup. Yes you would need a separate integrated amp but that is no different than having a separate sub. And the ability to adjust the volume and tone would be great for tweaking to get it perfect. This seems too simple (or its a Eureka moment)....But instead of taking the signal from the amp speaker output (and reducing it with a voltage reducer) does anyone see why you can't do this directly from the positive preamp outs? I would toss my sub to the curb if I could hook up a couple bookshelf speakers and a spare amp to get some kind of SDA effect. Just one question though (to anyone). Unless I am misunderstanding (which is highly likely) with this setup it seems like both dimensional speakers signal and phase is the same (mono) on both right and left dimensional speakers. Is this how it works on the original SDAs? Or is the phase different between the right and left channels? I wonder how many of the nay sayers have heard what the op is proposing doing? Or how many have heard stacked sda's that I was advised against?? I say give it a shot and you just may learn something and have fun in the process. I'm betting the "experiment" will also make you appreciate your CRS's a LOT more. It's also not a bad idea to have a reference point of how bad something can sound. I just turned my SDAs into normal speakers. I tried doing that, but I couldn't figure out how to unplug those pesky things. I guess Grandpa's rusty jack-knife through the dimensional drivers would have done just as well, but it's in my tackle box and the pugs took it fishing last week and somehow it fell out of the boat and is now sitting at the bottom of Lake Champlain. All other sharp objects have been removed from my "grab area" ever since...."the incident". When he would hear someone complaining about how hard they're job is, or what a crappy day they'd had at work, my dad would say, "Beats diggin' ditches," which he did for years for Cincinnati Gas and Electric back in the late 1940's. I think about that once in a while when I'm complaining about my job, which in actuality is about as good as it gets and better than I deserve. @mlistens03 - This is from an interview with Steve Jobs. After he got fired from Apple Computer. But before he changed the world forever with the iPhone. This is interesting stuff -- Personally I am fascinated by analog solutions to brute force problems (e.g., analog, B&W compatible color television, or analog, mono-compatible FM multiplex stereo). The signal processing and manipulation (not to mention the phase linearity, timing and bandwidth requirements) are impressive. I say this as a prologue to a random thought: I'd have to think, in this day and age, that the signal manipulation required for the "SDA effect" would be far easier to implement in the digital domain. Indeed, my impression was that the proliferation of soundbars on the market today would do something along these lines(?). And I say that as a prologue to an on-topic (sort of) comment. There's a countermelody to this thread referencing the "Hafler circuit", but I am not sure some of you would know what that is! David Hafler (of Acrosound, Dynaco, and Hafler fame) developed a really simple method for ambience recovery, which he ultimately called "Dynaquad", that presaged the quad frenzy of the early 1970s. Ken described it well, but I thought it would be interesting for folks who want to experiment with similar techniques to see the "Dynaquad" circuit. The Dynaco "Quadaptor" used a unique (AFAIK) triple gang rheostat to adjust signal levels. I've (ahem) actually got a Dynaco QD-1 "Quadaptor" a-sittin' on a shelf (imagine that?!). Other companies (e.g., Radio Shack, Lafayett, Electrovoice, etc.) sold variants of this basic Hafler design, and, in fact, Dolby "ProLogic" used the same basic approach as Hafler's, with the addition of "logic steering" to enhance the 'rear channel' effects (whatever that might mean in a practical sense!). Hey guys. I have SDA! After reading Ken's posts on active dimensional SDA and looking at the schematics for the original blade blade SDAs I hooked up something that works! I now have an accessory bookshelf system that gives the SDA effect. Not wanting to mess up anything valuable I searched my basement and found a $30 yard sale AV receiver and some $10 goodwill Polk bookshelf speakers. I also found 20 feet of no name wire (starting to turn green too). 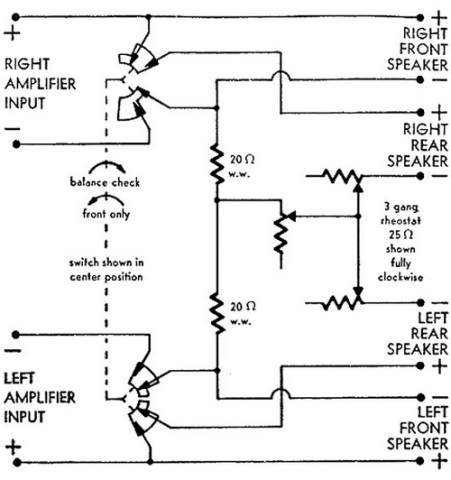 Looking at the Polk schematics the dimensional speakers are only fed from the positive outputs on your amp. So I put a single wire from the right positive amp output to the right speaker positive (and the same for the left positive to left speaker positive). To complete the circuit you have to mimic what the SDA interconnect does. To do that you take a separate 2 strand piece of speaker wire and connect one end to one speaker with the correct polarity. Then the other end to the other speaker with reversed polarity. It is very important you get the interconnect connected right. If you connect both ends the way you normally connect a speaker you will have a short! One end MUST be connected in reverse polarity. Check the DC resistance before hooking it to your amp! It should not be close to zero ohms. When I hooked the speakers up this way I checked DC resistance (at the leads that go to the amp) and it only read about 2.8 Ohms. Half of what a single speakers was. My cheap amp couldn't take that low of an impedance so I hooked one 1 ohm resistor (10 watts) on each side between the amp out and the speaker (to the single amp out wire connect one end to the resistor, then connect the resistor to the speaker positive). To test, when you play this alone everything sounds spacey. There is no imaging and you can't tell where the sounds are coming from. Also the vocals and anything centered are barely audible. My CD player has 2 outputs so I connected one to my regular setup and one to the new "SDA" setup. I started listening to Abbey Road with the "SDA" volume off and it sounded like it always does. But when I turned up the volume of the SDA setup it was WOW, My room instantly opened up It was like I was in a cavern and its the first time I clearly head front to back depth 3-D with my system. I could also hear sounds coming from outside of where the speakers were placed. Now for a BIG disclaimer. My knowledge of schematics are rudimentary at best. My writeup might have something unclear or ambiguous. Try and understand the concept for a reality check. If you set up the interconnect wrong you will short your amp. You will be running speakers in parallel giving half the impedance. Some amps can't take that so I had to put resistors on mine. Check for heat. I wouldn't try this with anything expensive. Actually you should only try this with disposable components you were going to throw away but kept it in your basement instead. Can someone point me a post somewhere that will give me an idea of what the deal was with the SDA line? I've heard of it but I'm not familiar with what all the fuss is about. Thanks. This thread --> http://forum.polkaudio.com/discussion/136502/sda-handbook/p1 See it's last post for the link to the SDA Handbook written by the forum's DarqueKnight which is an excellent place to start. Direct link also available here: http://vr3mods.com/LCSDAUpgrade.php Lots to read. Don't believe the people that say it will not work or will sound awful. Some are of the impression that if it does not have an SDA badge on it it can't possibly work. In actuality the concept is quite simple and easy to replicate as you have found with your experiment. Your just using four enclosures instead of two. As Ken points out the use of separate speakers and amp give you the benefit of experimenting with different dimensional driver spacing and control over their levels. My experimenting was similar to yours though I used a midrange driver bandwidth limited from 350-2k hz. In later generations of SDA 's Polk found it benificial to limit the dimensional signal range to approx 150 -2k or so. You might try disconnecting the tweeters in your extra speakers. Yes, I believe they bought RadioShack or something, and now RadioShack parts are sold in HobbyTown. Mind boggling sound stage. Do some Googling, and you can find info on them. Then get your ears on a set of SDA’s. They are awesome. I set this up just to experiment some but I was amazed at the difference this crude setup made as soon as I turned it on. It was far from subtle and instantly recognizable . As you turn the volume up on the SDA amp and you can hear your room getting bigger. Never heard anything like it before and the ability to dial in the amount of SDA is nice too. I used Polk M10 bookshelf speakers so it does have a limited base response. In my limited listening time I did start hearing a lot of mid-higher pitched sounds I never noticed before on the far edges of the room. It didn't sound too bright to me but I don't hear treble the way I used to. Someone with better ears should try it. Why is polk no longer making them? Wide baffle speakers don't sell anymore, especially to the masses. 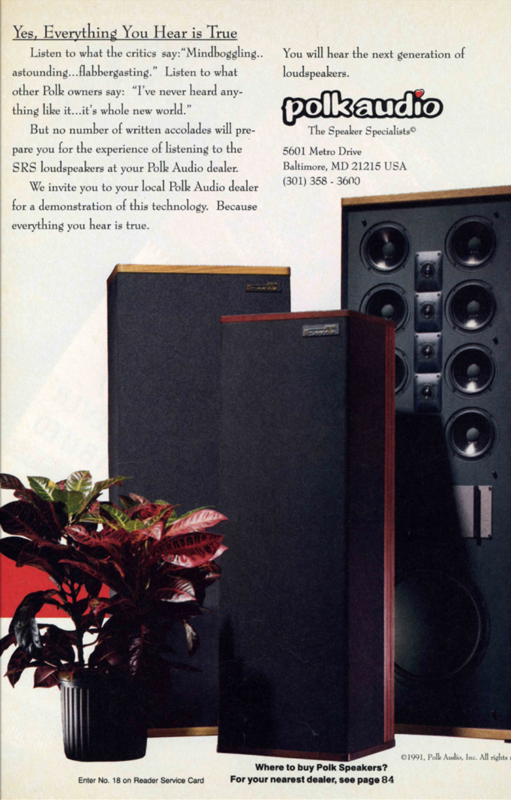 Well, you’d have to ask someone more knowledgeable for a definitive answer, but I’d guess because they’d have no where to sell them except the big box stores, as most Hi-Fi shops wouldn’t sell speakers with the Polk badge on them, except for an enlightened few. And you can imagine how terrible it would go for them to Ben sold by they people at big box stores who know nothing and would sell them with non common ground amplifiers. They may have also been expensive to manufacture. FWIW, based on information from Google, the last (?) 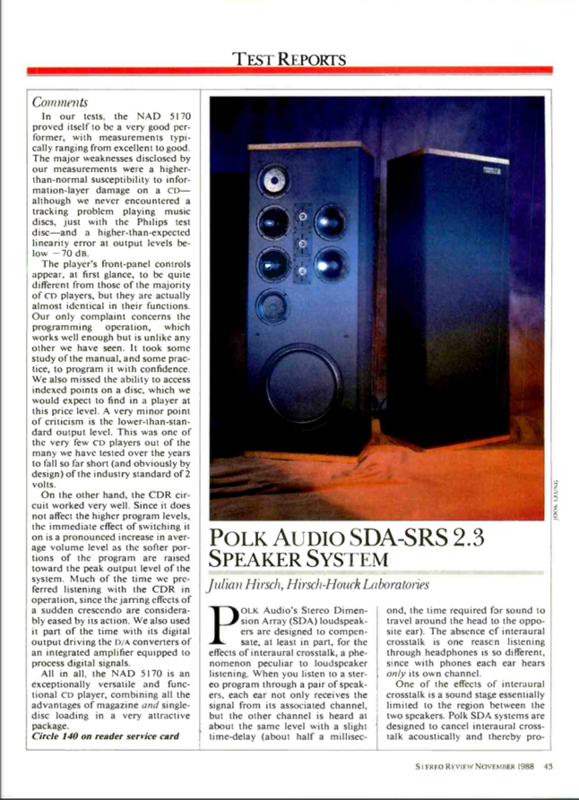 test of an SDA model, at least from Stereo Review, appears to have been November 1988.